Mesothelioma is a rare type of cancer that occurs in the thin layer of cells lining the body's internal organs, known as the mesothelium. There are three recognized types of mesothelioma. Pleural mesothelioma is the most common form of the disease, accounting for roughly 70% of cases, and occurs in the lining of the lung known as the pleura. Peritoneal mesothelioma occurs in the lining of the abdominal cavity, known as the peritoneum and pericardial mesothelioma originates in the pericardium, which lines the heart. You can be at risk to develop mesothelioma if you were exposed to asbestos in the workplace or at home. 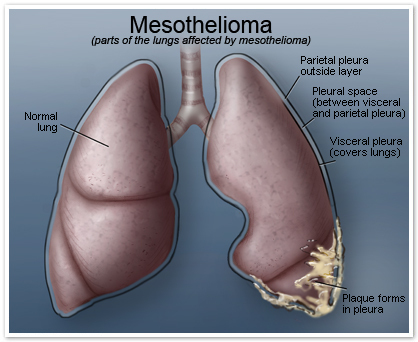 Mesothelioma is caused by exposure to asbestos and the inhalation of asbestos particles. In most cases, mesothelioma symptoms will not appear in an individual exposed to asbestos until many years after the exposure has occurred. Those with a past asbestos exposure history experiencing symptoms should consult a physician with experience in accurately diagnosing mesothelioma. The earlier mesothelioma is diagnosed, the more likely it is to be caught at an early stage. At earlier stages of mesothelioma progression, more treatment options are available and oftentimes a better prognosis is given. Once a person has been diagnosed by a qualified mesothelioma doctor, the next step is to discuss mesothelioma treatment options and to develop a treatment plan. Recent scientific research has produced significant breakthroughs with regard to treatment protocols for mesothelioma patients and more options are now available for managing mesothelioma and supporting improved quality of life. Newly diagnosed mesothelioma patients often have many questions for their doctors about the treatment options that would be most effective for them. Conventional treatment options for mesothelioma include surgery, radiation and chemotherapy. Recently, chemotherapy drugs including Alimta® and Cisplatin have showed promising results. Mesothelioma clinical trials as well as experimental treatments are other options that certain mesothelioma patients may be eligible to participate in. Our site features a comprehensive mesothelioma cancer treatment section that includes important information for patients and families. We've included resources on top mesothelioma experts such as Dr. David Sugarbaker and Dr. Raphael Bueno, as well as a comprehensive list of cancer centers where mesothelioma treatment takes place. Beyond the conventional treatments for mesothelioma, certain alternative therapies may provide assistance to mesothelioma patients. We continually update this section of our site as new mesothelioma treatment information becomes available.